The United Nations predicts that by 2050 our growing global population will require 70 per cent more food than is available today. Compounding this enormous shortfall is a loss of agricultural land to urbanization, and the effects of global warming–particularly high temperatures–on crop growth. 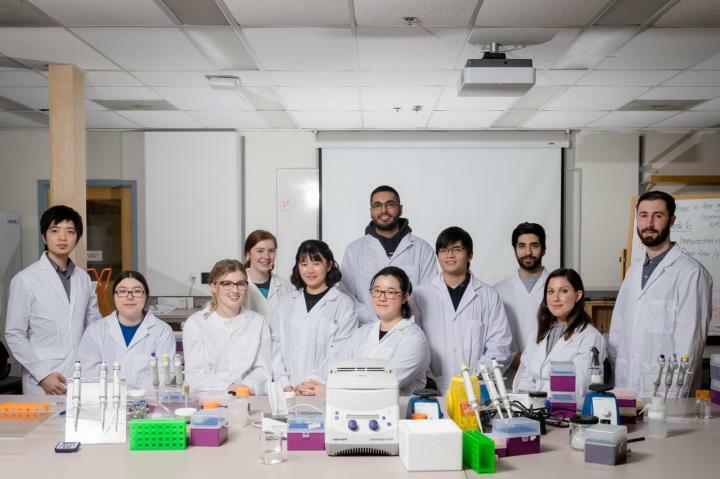 SFU biological sciences faculty Jim Mattsson and Kathleen FitzPatrick, together with students in their Genetic Engineering (BISC 357) course, are working towards a solution using CRISPR genome-editing technology. "Rice and wheat are essential to diets around the world," says Matsson. "That's why there is a worldwide effort to improve rice and, eventually, wheat so they can be productive at higher temperatures." His students are using the cutting-edge CRISPR technology to decipher which rice and wheat genes need to be modified to improve growth. Plant species such as sugarcane and millet, for example, have naturally evolved to produce at higher temperatures, but that hasn't happened in their relatives, rice and wheat. Mattsson figures that by identifying the genes responsible for forming veins in millet leaves (more veins permit greater photosynthesis and therefore growth), it should be possible to reverse engineer more veins in rice and wheat plants. So during the fall 2017 term, Mattsson and FitzPatrick challenged their students to learn how to use CRISPR to identify the genes behind the evolution of heat stress tolerance in millet. With this successfully accomplished, future classes will compare these millet genes to their cousin genes in rice to see how the rice genes need to be changed or reverse engineered to gain heat tolerance. "The students were thrilled to discover that they had successfully put together DNA fragments capable of inactivating, one by one, over 30 individual genes in living millet plants," says Matsson. "They knew the theory behind CRISPR, but to get a chance to actually splice genes was pretty exciting for them." Student Serina Li says, "I found that the course provided me with a really good foundation for the molecular cloning techniques and applications that are currently used in labs. "We were working on specific projects while learning the techniques involved, so that we were able to apply what we learned right away. This was one of my favourite aspects of the course, as it made the material easier to learn and also was more relevant to how one would conduct these types of experiments as a real scientist." Around the world, scientists have high expectations of CRISPR technology, mainly for treating human disease. Mattsson is equally delighted with CRISPR's prospects for plant engineering. He says, "In my class alone, students are discovering what genes are doing with a precision and scale that was unheard of just a few years ago."